LAWRENCE — The concrete canoe team at the University of Kansas School of Engineering has its paddles ready for the annual Concrete Canoe Competition, hosted by the American Society of Civil Engineers (ASCE). KU will compete against other collegiate teams at the Mid-Continent Student Conference on April 22 and 23 at the Missouri University of Science and Technology, in Rolla, Missouri. This year, the team must construct its concrete canoe without using any stain. In previous years, the team has been able to use stain in its design. Team members say this is an important change, because one-quarter of the competition is based on which canoe looks the best. This year’s canoe will have an arctic theme, in honor of KU’s Center for Remote Sensing of Ice Sheets (CReSIS). It will be all white with icicles along the top edge and is named Floe, in reference to a floating sheet of ice. Since the competition canoe won’t hit the water until the actual event, the team will practice with plastic canoes at Lone Star Lake. To prepare for the competition, the team will practice sprint and endurance races. All the sprint races are a straight 100 meters down and back. The endurance races are 600 meters. “To simulate what it’s going to be like racing in the concrete canoe, we are having people sit in the middle of the plastic canoes to act as the weight that will be the concrete in the canoe,” Multer said. The competitions are split up into men’s, women’s and co-ed events. 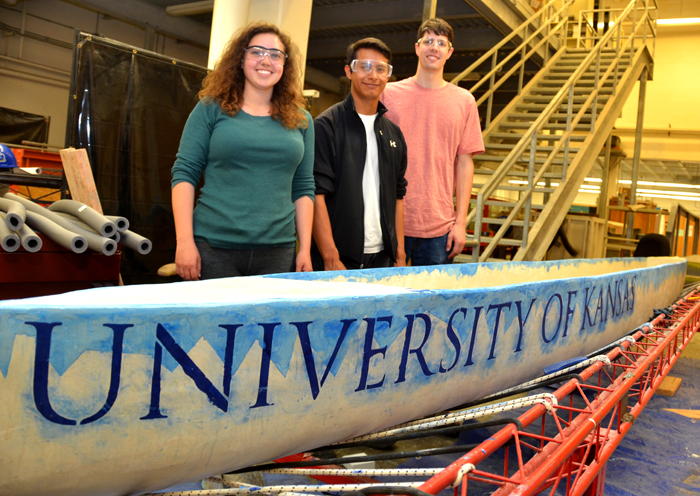 The KU concrete canoe racing team will consist of five men and five women. A major goal for this year’s competition is to get team members acclimated to the competition. The team lost a majority of its members to graduation last year, and most students involved are new to the team. The concrete canoe team is an opportunity for students to get involved outside of the classroom and gain hands-on experience. With a first place finish at regionals, KU will earn a spot at the national competition, which is June 9-11 at the University of Texas-Tyler, in Tyler, Texas. Photo: Members of the KU concrete canoe team put the finishing touches on this year’s entry in the annual American Society of Civil Engineers Mid-Continent Student Conference concrete canoe competition. They will compete Friday and Saturday at the host school, the Missouri University of Science and Technology, in Rolla, Missouri.